Freestyle Libre is only available for purchase from Mediray New Zealand, please click below to place your order. 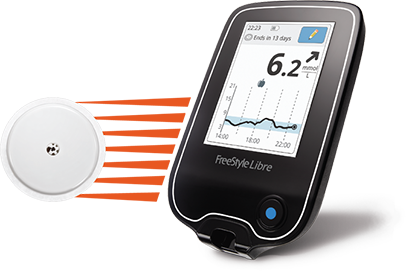 The FreeStyle Libre Flash Glucose Monitoring System is a glucose monitoring device indicated for detecting trends and tracking patterns in persons aged 18 and older with insulin dependent diabetes mellitus. Health professionals and consumers should be aware about the limitations of available scientific evidence for use of this device in any other groups of patients who require diabetes management. For a complete glycemic picture, scan once every 8 hours. The FreeStyle Libre software, designed to be used in conjunction with FreeStyle Libre reader and sensor, provides a snapshot of glucose patterns and variability; for more information, see the Software page. The reader can capture data from the sensor when it is within 1cm to 4cm of the sensor, even through clothing.